You’ll note, gentlemen, the correct way of doing everything, even in defeat. You wouldn't get away with this kind of thing today. 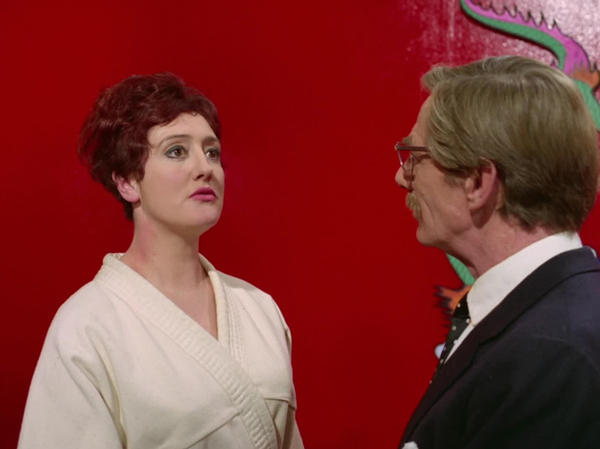 An undisguised remake of third season episode The Charmers, right down to its choicer dialogue, looking at them side by side is neither revealing as a shot-for-shot exercise (Gus van Sant's Psycho) nor the changes resulting from a switch to colour and upping the budget (The Man Who Knew Too Much, although there were additional substantial changes there, of course). Instead, both versions have their positives and negatives, but for me, this new one never quite manages to improve sufficiently on source material that was never quite there in the first place. Groski: What's the matter with him? Is he dumb or something? Percy: No, he's British. Naturally, he wouldn't dream of discussing business with you until he's been formally introduced. What changes there are, are often cosmetic. 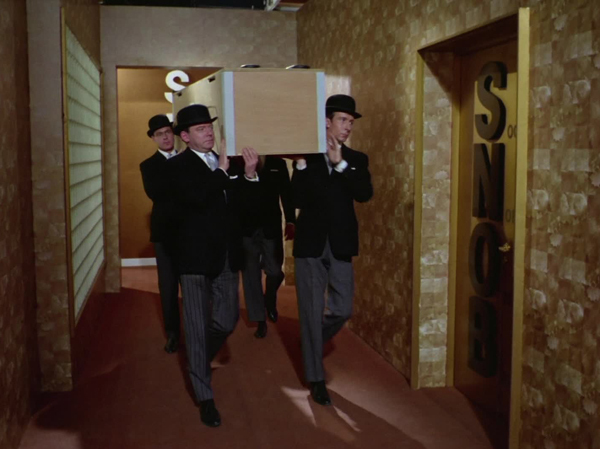 The charm school for killers, "A breeding ground for young gentlemen" is essentially the same, but the Academy of Charm for Aspiring Gentlemen is now the more era-overt S.N.O.B. (Sociability, Nobility, Omnipotence, Breeding Inc). 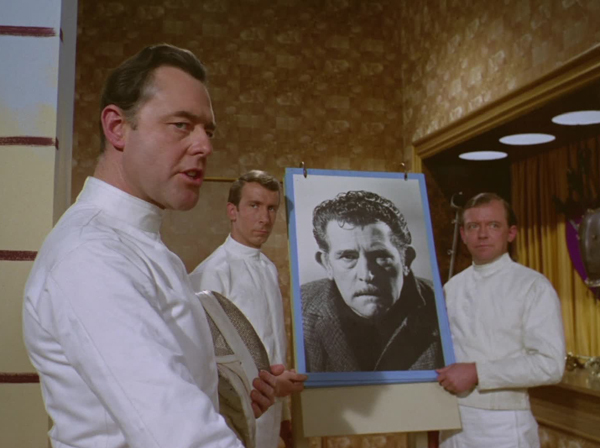 The dental surgery of the original has been substituted for a chiropodist, but its significance to the plot is otherwise as tenuous as ever. 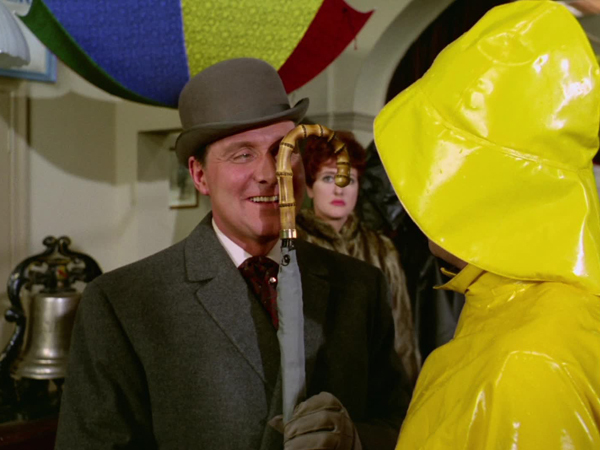 The gentleman's outfitter has become more focussed on umbrellas (where before crates of bowlers concealed bodies, now it's brollies). 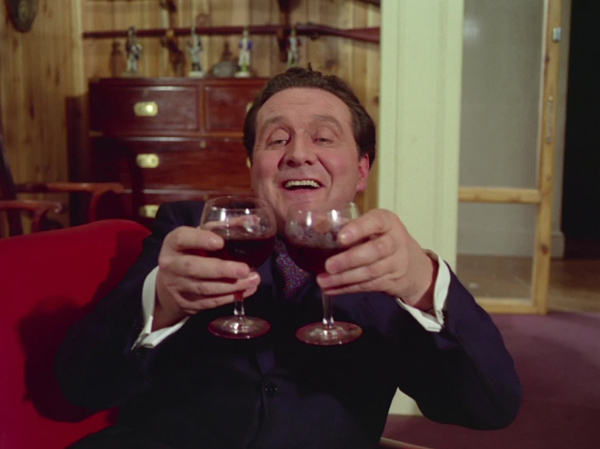 Steed: How I envy you, working cheek by jowl with Ivan. 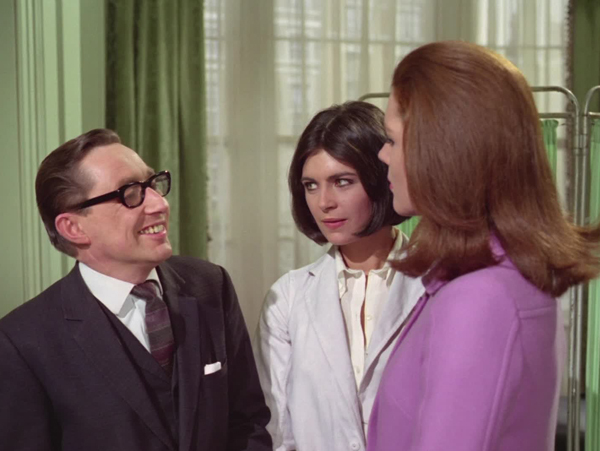 Mrs Peel: I can assure you, my cheek's going to be nowhere near his jowl. In most respects, I'd argue the original is superior. 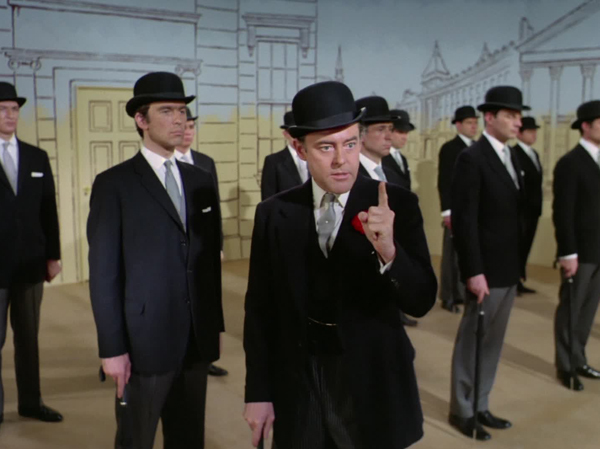 The teaming of Russian agents with British ones to find out who is killing the Russians is repeated, but Philip Madoc (2.7: The Decapod, 2:25: Six Hands Across the Table, 3.10: Death of a Batman), although unceremoniously bumped off and dumped in a crate, makes more of an impression as Ivan than John Barcroft did when teamed with Mrs Gale. 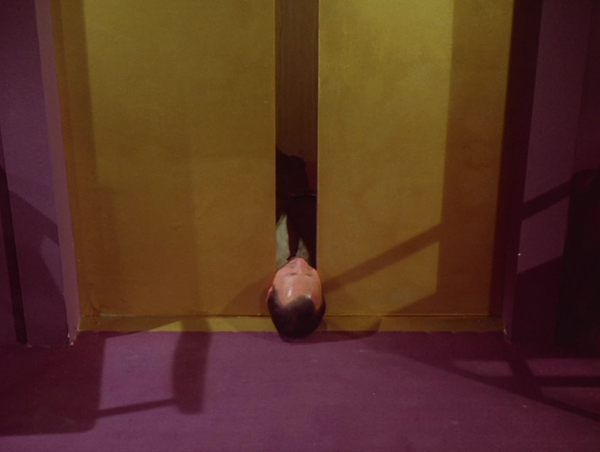 Steed: Hello Comrade, where's Nutski? 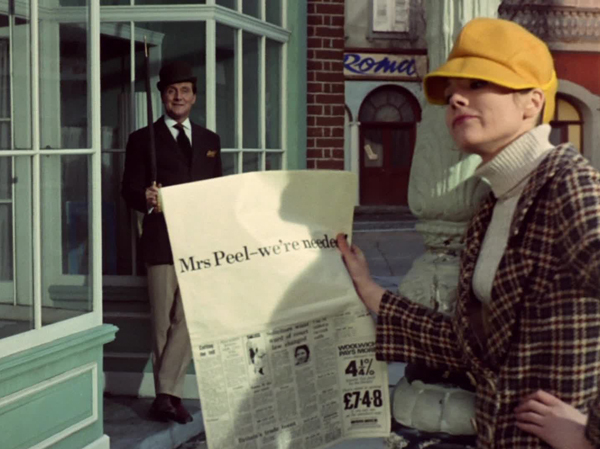 Mrs Peel: I've handed in my notice. 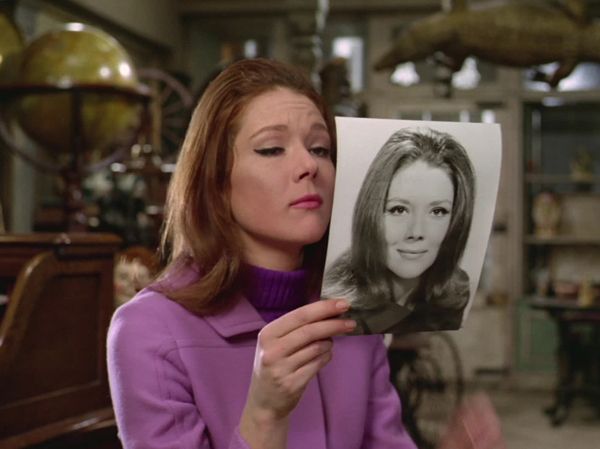 Mrs Peel: The other side was cheating. Nutski had no intention of seriously honouring the truce. 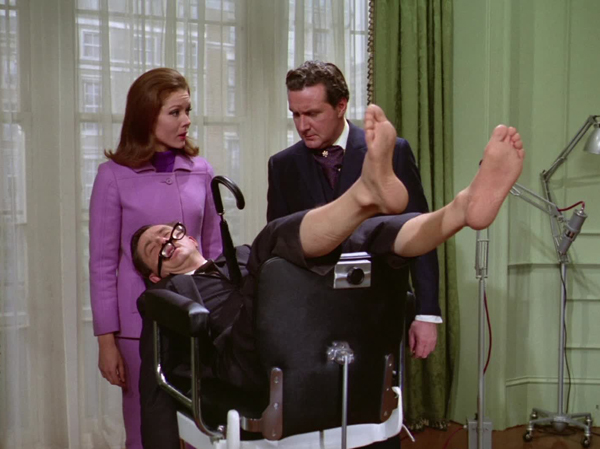 Steed: Well, I'm not surprised. I never thought he would. 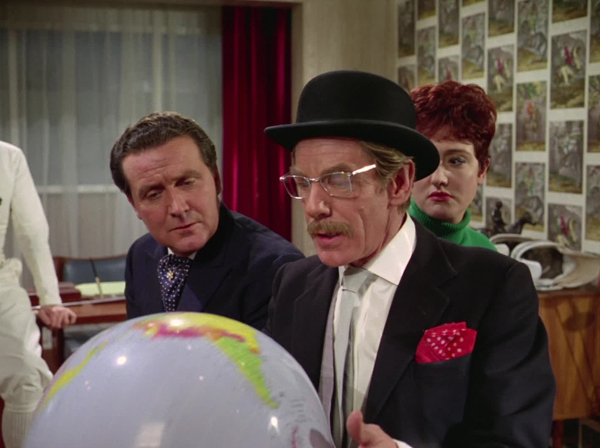 In contrast, while his Brodsky will never be my favourite Avengers comedy character, Warren Mitchell made a much better Russian boss (Keller) than Michael Gough (4.7: The Cybernauts) as Nutski, who simply cannot pull off the comedy (the "He laughed all the way down" reminiscence is repeated line-for-line, and very funny in the original; here, it resembles nothing so much as a flaccid regurgitation of an old Python sketch, with no one putting anything into it; Steed's "I haven’t killed anyone all week" is recycled too). 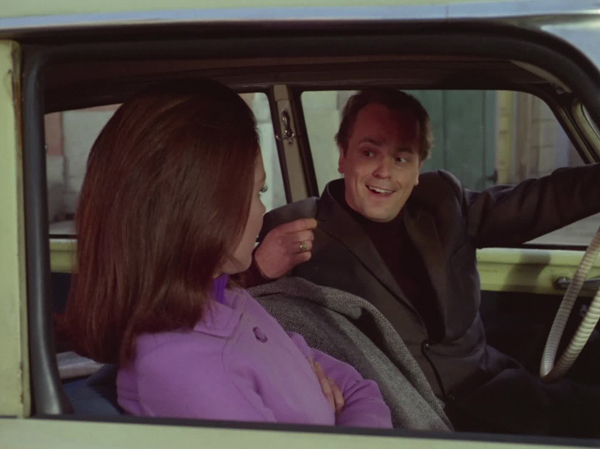 Gough's also unconvincing with his accent (Madoc clearly loves doing his) and doesn't seem to be putting much into the dramatic side either. In both, they're the mastermind behind the charm school, selling secrets to the highest bidder, but Nutski's ambition is somewhat higher than Keller's. He plans to use his "highly trained force, and they get better every day" to introduce a third world power, the State of Nutskiville. If Gough's performance were more engaging, his megalomania might have been too. 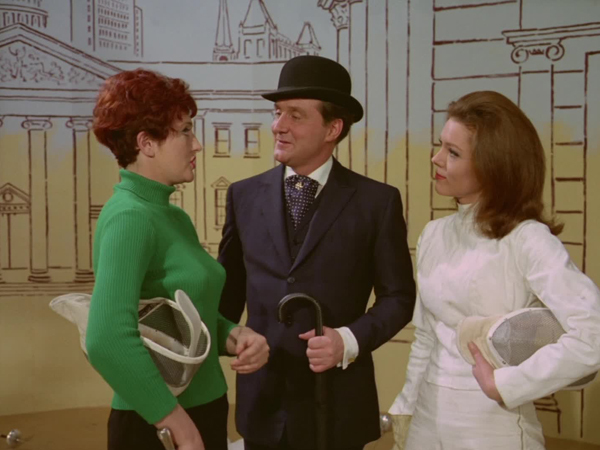 Steed: May I call you Olga? Olga: Comrade Veloski. Informality breeds undiscipline. 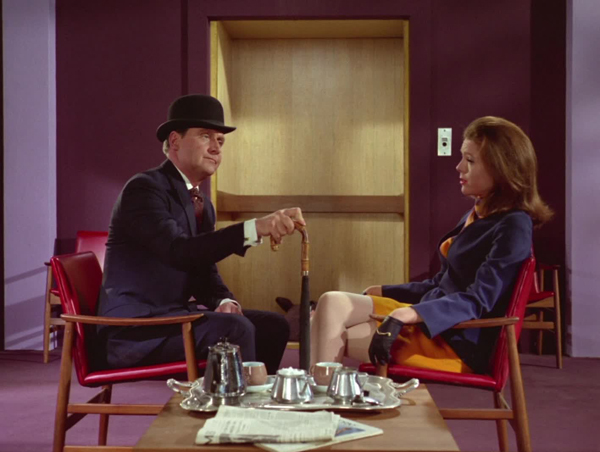 Steed: You are absolutely right. Will you have a drink? Olga: Hard liquor softens the brain. 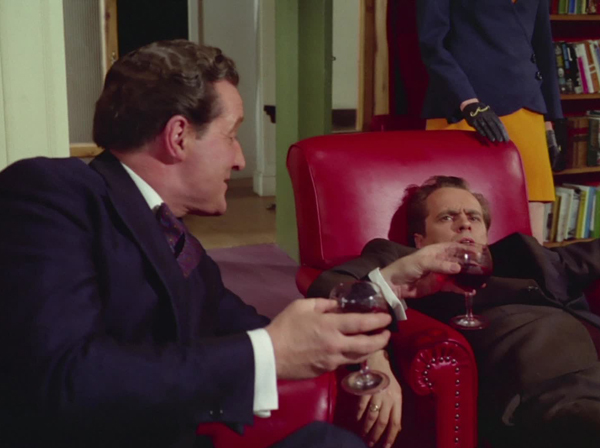 Anna Quayle has fun deadpanning as "Olga from the Volga", a bone-crushing, permanently unamused presence, and her genuine Russian agent makes much more sense than Fenella Fielding's actor playing a spy. 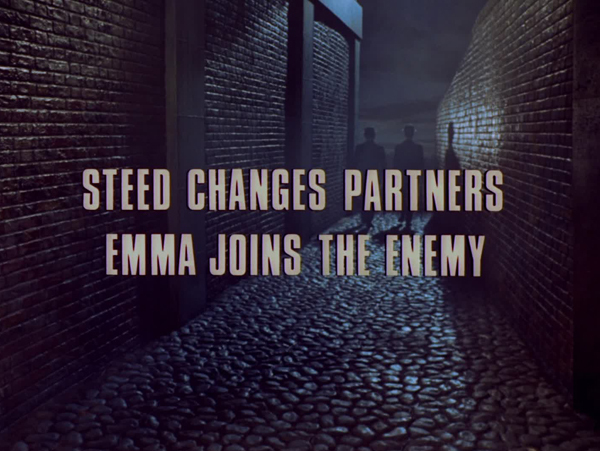 That needs to be countered against Fielding having a better rapport with Macnee, and her character being more engaging. Still, at least Olga is sufficiently distinctive that she diverges from the path of a straight retread ("It is as I expected. Opulent, luxurious, expensive and thoroughly decadent"). Ponsonby: Mr Watson! 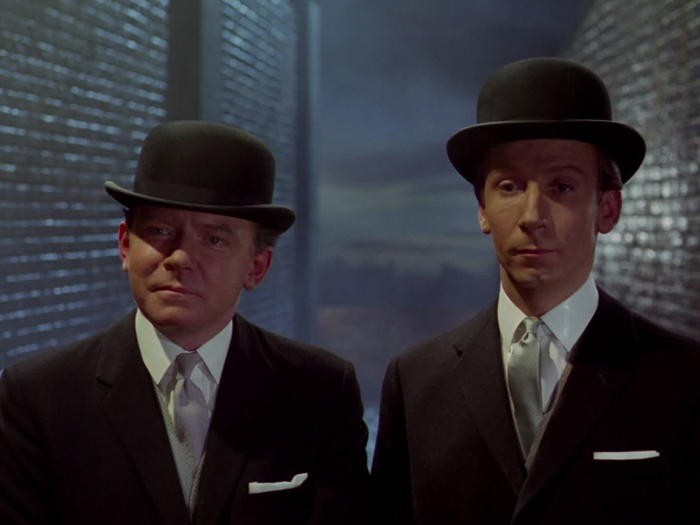 We are waggling, Mr Watson. We are waggling when we should be thrusting. We’ve had to talk to you about waggling before. Up, man. Up! 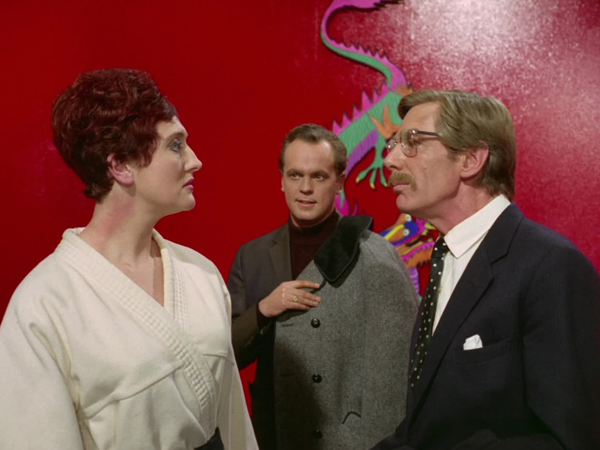 Ponsonby (Terence Alexander, 4.1: The Town of No Return) is no match for his corresponding charm school head Mr Edgar (Brian Oulton) either. The latter's veneration of Steed is very amusing, and Alexander just can't equal that. 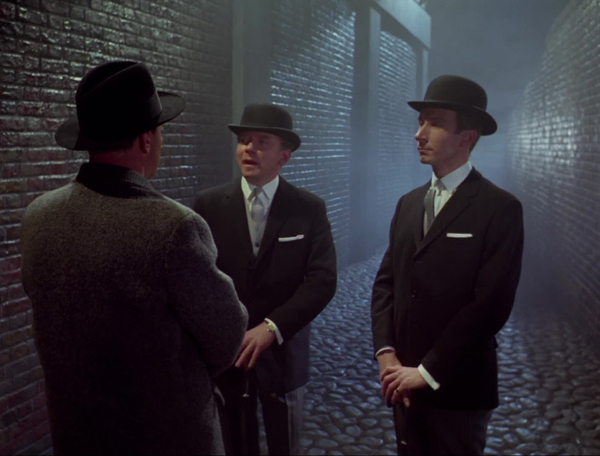 He does however, offer some nice touches such as his dismissive acknowledgement of Olga ("And you too, madam") after effusively greeting Steed with "Allow me to welcome you to SNOB", and his informal "And as you know, Mr Steed, a young gentleman is naked without his umbrella". Best of all is his approval of Steed's raising his hands when surrounded: "You’ll note, gentlemen, the correct way of doing everything, even in defeat". Steed: Embarrassing. If he had been naughty, they might have had the good manners to pop him off in his own country…. It's just not cricket. 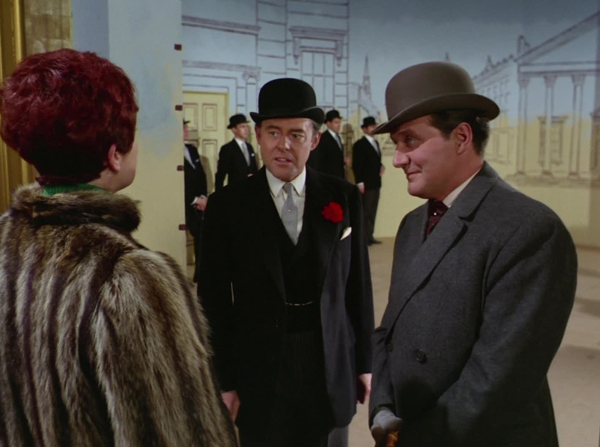 There's an emphasis in the early stages on Steed's own presumption of gentility, and the correct way of doing things in relation to bumping off Russian spies on British soil, if done by the Russians themselves ("Awkward phase or not, I don't approve of it"), although it doesn't really go anywhere, and there's no concluding moral about those who use manners and etiquette for villainous ends (although that's probably for the best, being as it's The Avengers and not needing to lead by the nose). Groski: You British, you'll be the death of me. The opening murders are staged with some aplomb by Charles Crichton (his only contribution to this season). Besides Groski (John G Heller, 4.12: Man-Eater of Surrey Green), Percy (Peter Barkworth, 1.22: Kill the King and 3.16: The Medicine Men) and Algy (Graham Armitage, Barney in The Macra Terror, 4.19: Quick-Quick Slow Death) enjoy several amusing assassinations, including via revolving doors and lifts, and are an effective presence, genteel but sinister for it. 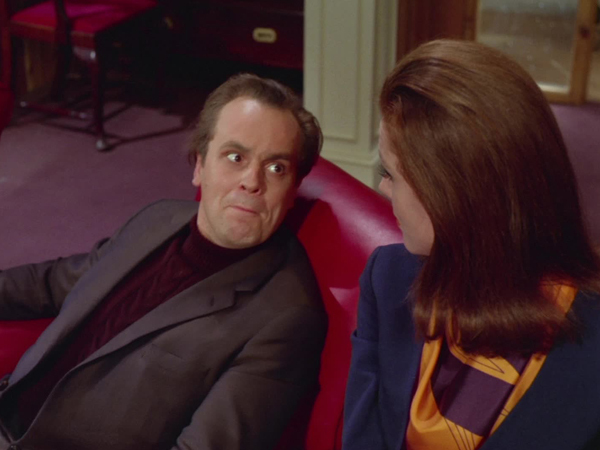 Percy: It will do no good to struggle, Miss Veloski. Algy: We’ve secured you with old school ties. Percy: And the bonds of the old school tie are nigh on impossible to break. Olga: Well thrown, comrade. You must have Slavic blood. 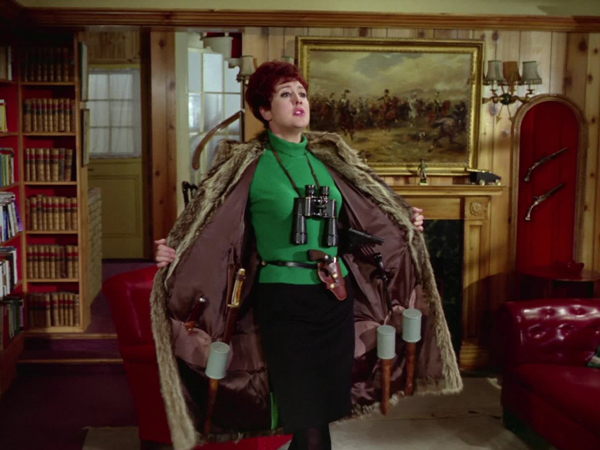 Mrs Peel: No, British through and through. 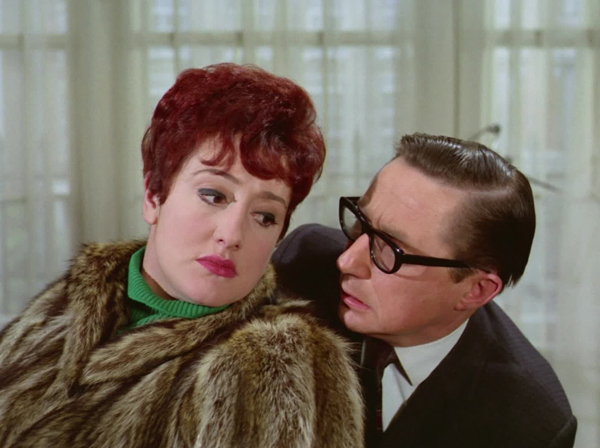 Steed: But you won’t hold that against her. 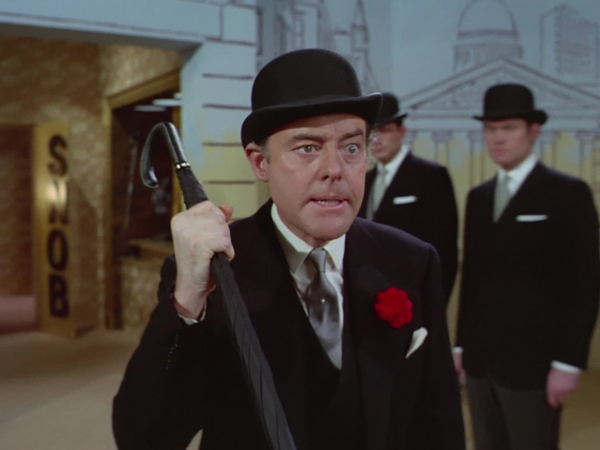 On the quirky character front, we have J Nathan Winters (Edwin Apps) as the purveyor of quality goods for the gentleman, announcing proudly that "Each and every one of these umbrellas has been rained on from a great height", but again, the obsequiousness towards Steed's class worked better in The Charmers; somehow, admiring his choice of umbrella doesn't quite do it. 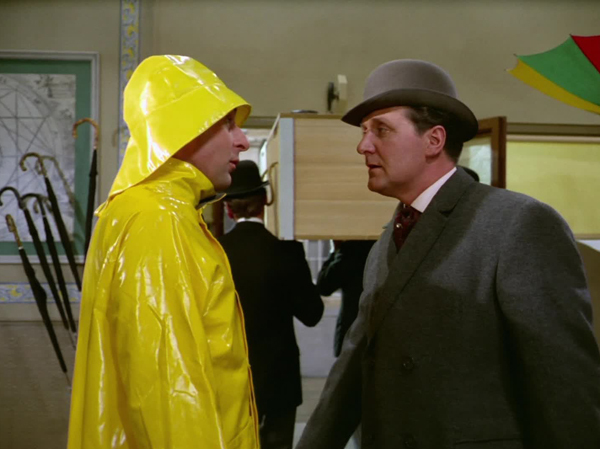 I liked Steed's parting "Hope it keeps wet for you. Bye". Hubert Merryweather (Timothy Bateson, Binro the Heretic in The Ribos Operation) the chiropodist is quite likable for all his being (partly) on board with activities of SNOB ("Your feet are now in my hands"). 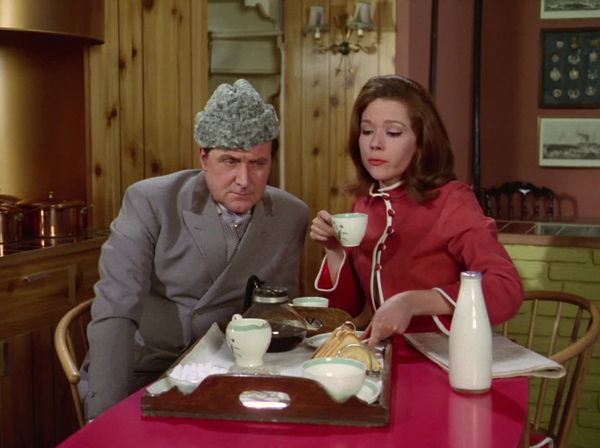 Mrs Peel: A certain, bourgeois, capitalist, decadent touch? The opening "We're Needed" finds the words appear on a section of newspaper (it would have been more inspired if the whole front page had been a mock-up), and the coda sees Steed appearing in a Russian hat (very cosy), reporting on an evening with Olga, who we learn is an accomplished bricklayer and can recite every party manifesto since 1922. These ending sequences have been quite variable, but this one, more germane to the story, is one of the more successful of the season so far. Not a remake that in any way justifies its existence, but mostly unobjectionable.